In their March 2017 communique, the G20 Finance Ministers and Central Bank Governors warned that “The malicious use of Information and Communication Technologies could …undermine security and confidence and endanger financial stability.” That is why, the Carnegie Endowment has proposed that the G20 explicitly commit not to engage in offensive cyber operations that could undermine financial stability, namely manipulating the integrity of data of financial institutions, and to cooperate when such incidents occur. Such an agreement by the world’s leading economies would send a clear signal condemning such activity and enable future cooperation. The G20 is now discussing such a commitment by its member states. This website is meant to serve as a hub providing more details about the G20 discussions, the related Carnegie report and proposal, reactions following its publications, as well as additional resources. The team at Carnegie’s Cyber Policy Initiative also continues to work with government officials, including national security officials, financial institutions, and other experts in the next phase of this project. Feedback is welcomed and stakeholders interested in engaging with Carnegie on this issue are encouraged to contact us here. 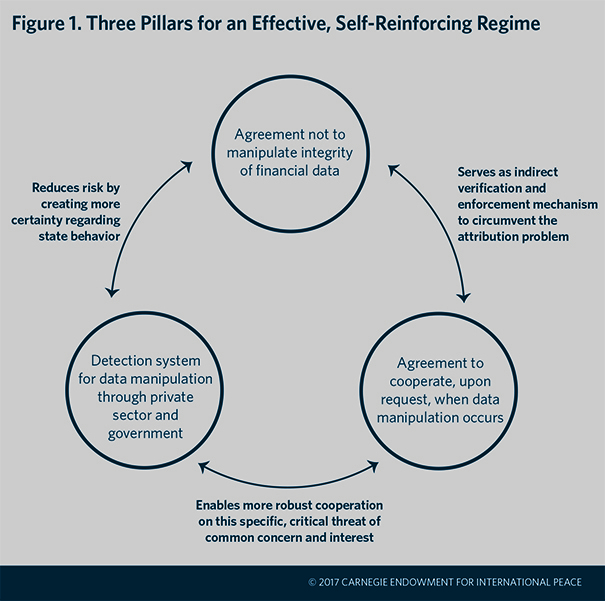 Tim Maurer, Ariel (Eli) Levite, and George Perkovich explain why it is vital to the stability of the international system to prohibit the corruption of data in the global financial system, and to strengthen a comprehensive norm to this effect. Beyond theft, manipulating the integrity of data, in particular, poses a distinct and greater set of systemic risks than other forms of financial coercion. That is why the Carnegie proposal focuses specifically on data integrity. (The Carnegie report also recognizes that the availability of certain data and systems is critical and proposes a two-step process to explore and conceptualize the two dimensions.) The complex and interdependent character of the financial system and its transcendence of physical and national boundaries mean that manipulating the integrity of financial institutions’ data can, intentionally and/or unintentionally, threaten financial stability and the stability of the international system. Importantly, unlike the 2007–2008 global crisis, this risk exists independent of the underlying economic fundamentals and will only increase as more and more governments make cashless economies an explicit goal. “Our economy is based on a system of accounts recording who owes what to whom at any moment. Those accounts are digitized, and so are back-up systems. An attack that destroyed or corrupted the accounts of a major financial institution could wreak devastating economic havoc unless those accounts could be quickly and reliably reconstituted. The risk extends beyond banks to securities exchanges, brokerage firms, investment companies, clearing organizations, and other financial enterprises. A sophisticated network attack could lock-up this sector. A logic bomb, for example, could randomly delete system files. According to one participant, that has already occurred, and it took time to understand what had happened and to fix it. But disruption is only one risk that could arise form from data loss or corruption. A subtle, more limited operation that corrupted the pricing of selected securities, for example, could be used to manipulate markets, create illegal profits and losses, and drive parties out of business. Major powers, notwithstanding their fundamental differences, have recognized this in principle and deed. The U.S. government reportedly refrained from using offensive cyber operations against Saddam Hussein’s financial systems. Russia’s 2011 Draft Convention on International Information Security explicitly suggests that “each State Party will take the measures necessary to ensure that the activity of international information systems for the management of the flow of . . . finance . . . continues without interference.” China also has a vested interest in the system, reflected, among other ways, by its successful effort to make the renminbi part of the IMF’s global reserve currency basket. Meanwhile, countries around the world are setting up or strengthening their CERTs specific to the financial sector, as, for example, India did in February 2017.
complement and enhance existing agreements and efforts, namely the 2015 G20 statement, the 2015 UNGGE report, and the 2016 cyber guidance from the Committee on Payments and Market Infrastructures and the International Organization of Securities Commissions (CPMI-IOSCO). For more details, please read the Carnegie report “Toward a Global Norm Against Manipulating the Integrity of Financial Data.” Carnegie’s work also builds on past efforts focusing on this issue listed below. Potentially the most harmful cyber attacks are those targeted against a nation’s critical infrastructure and associated information systems. Failures of, or disruptions to, critical information systems may impact extensively upon the normal functioning of society with potentially disastrous consequences. Therefore it is vital to enhance international co-operation and mutual assistance for the purpose of critical information infrastructure protection. In our view, the protection of ICT-based or ICT-dependent critical infrastructure subject to State’s jurisdiction constitutes responsible State behavior. In the spirit of UN Resolution 58/199 States are encouraged to define their nationally critical infrastructure, assign responsible institutions and develop protection measures, including comprehensive national crisis preparedness and response procedures. In addition, States should facilitate cross-border cooperation to address vulnerabilities of critical information infrastructure transcending national borders. While we consider it necessary to continue developing practices on the protection of all types of critical infrastructure, we would like to focus particularly on the issue of stability and security of the financial system, which we consider to be in the interest of all States due to its centrality for the functioning of individual economies as well as the global economy as a whole. Due to interdependencies, attacks against individual financial institutions as well as financial services can cause extensive damage and reduce public trust toward the digital economy. For the full version of Estonia’s input paper, click here. In 2010, Richard Clarke and Robert Knake propose in their book Cyber War an international agreement that would “prohibit altering data or damaging networks of financial institutions at any time, including the preparation to do so by the emplacement of logic bombs” (p. 267). In most major nations, the financial sector has become inherently international and interconnected. The international financial system is based to a large degree on trust, a belief that assets recorded in data bases do in fact exist in the types, amounts, and ownership recorded. Altering and falsifying those databases, or engaging in unauthorized ownership transfer, would significantly undermine the international financial system. Thus, nation-states have a major incentive to refrain from altering data in or disrupting the communications system of the international financial system. The United States reportedly considered and rejected a cyber attack on the Iraqi banking system in 2003 precisely because of a fear that such an attack would be a precedent that would be used by others to justify similar attacks, which would undermine the essential trust in the international financial system. Arms control often beings with nations promising not to do things that they never had any intentions of doing anyway. Thus, a first step to a cyber war norm might be a series of unilateral declarations that financial sector targets will be avoided. For the full version of the Good Harbor paper, click here. Protecting Financial Data in Cyberspace: Precedent for Further Progress on Cyber Norms? To protect the financial system against cyber threats, this project by Carnegie’s Cyber Policy Initiative provides innovative research, actionable policy proposals, and regular updates on key developments for decisionmakers in government and industry as well as other stakeholders.